It’s freezing. It’s been raining. The time for mashed potato is upon us. Am I right? I am. Yeah, my kids and husband will gladly hoover up epic amounts of cous cous and quinoa during the rest of the year but when we get to this kind of deep winter it’s mash that really gets them excited. My mother, who has no truck with my weird grains (“but cous cous isn’t really food is it?……….and what’s quinoa????????? !”) likes to give me knowing glances as they lorry into a third portion of shepherd’s pie. Last week’s cabbage and spuds said colcannon to me from the start ( jeans can stretch!) and as it was a week night I wanted to keep things really simple and just make one dish. Adding some smoked Gubbeen chorizo (you can get it in Sheridan’s and it’s well worth tracking down if you’re round town) not only takes an Irish classic to a whole new level it makes a meal out of this humble dish. If you want to go further, this version will make a simple piece of grilled fish sing. A side of broccoli or romanesco lightly steamed then tossed in garlic and chilli and you’ll be practically taking things to dinner party level…..
150gr chorizo (smoked Gubbeen if you can get it), sliced finely and cut into half moons. Peel the spuds and cook in boiling salted water until tender. While the potatoes are cooking heat a large knob of butter on the pan with a drizzle of olive oil. Sauté the onion gently until soft and caramelized. Throw in the cabbage and fry until wilted. When the spuds are cooked, drain then mash til super creamy with a generous knob of butter and a dash of milk. Season well with salt and lots of freshly ground black pepper. Heat a little oil in a pan, throw in the chorizo and fry until crispy. To finish off, stir the onions, cabbage and half the chorizo into mash. Top with the remaining chorizo and serve. A busy week meant I kept this dish very simple. It’s the perfect midweek supper. Lots of flavour and ready in less than half an hour. Green beans were the starting point then spuds for bulk and finally cherry tomatoes (colourwise I couldn’t resist!!!) completed the dish. The fire and heat come from the chili and ginger then for the Indian flavour it’s equal parts coriander powder and turmeric and 1/2 the amount again of cumin seeds. It’s a mix that works with any veg and obviously you can dial the heat up or down by using as much chili as you want. Dried works just fine as well. With this recipe you need to have everything ready to go before you start so it’ s a little different to most of my recipes where you throw on an onion and mooch around preparing everything else as it gently fries. This one is more on the fast and furious side. You can do it as you go but you’ll need to be fast. The upside is that the dish is ready in about 20 minutes and you can’t say that about a lot of curries (well, mine anyway). Right, so to get going have the garlic, ginger and chilli prepared as described above. Peel the potatoes and chop into large bitesize pieces. Wash the tomatoes and cut in half. That should do it for now. Heat a generous dollop of coconut oil on the pan. Add the garlic, ginger and chilli and gently fry for a minute or two before adding the spices along with a generous pinch of salt. Fry for another minute then add the tomatoes. Gently cook for a couple of minutes before adding the potatoes and the stock. Cook over a gentle heat for about 10 minutes and while this is happening wash, top and tail your beans. Now would also be a good time to put on your rice if you’re having some. Add the beans to the pan. Cook for a further 6 -7 minutes until the beans and spuds are tender. Serve with rice and/or naan bread. 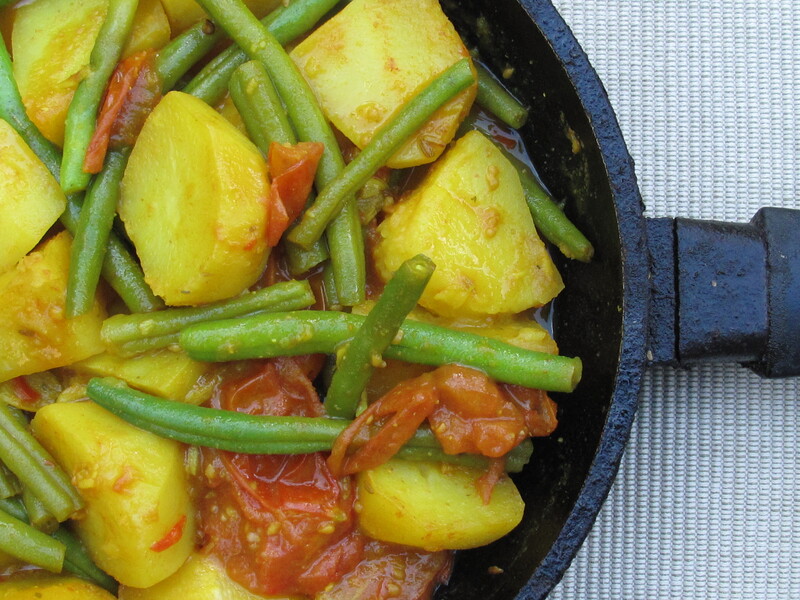 This recipe will easily feed 2-3 hungry people, 4-5 if you serve it with some daal. Those funny looking knobbly creatures in your bag this week are called Jerusalem artichokes aka sunchokes. If you haven’t had them before don’t panic – they’re a bit of a pain to clean but these tubors have a lovely nutty flavour and can be prepared very simply – pan-fried til golden is a great starting place. Just scrub them really well then chop into chunks and pan-fry in olive oil til crispy on the outside but nice and tender inside. A spritz of lemon and you’ve got something to pick on with beers before dinner or a lovely side dish that goes especially well with meat. Then there’s that great Nigel Slater warm salad with bacon and a mustard dressing. They make brilliant soup but my own recipe for a warm salad with smoked cheese and lamb’s lettuce is one of our favourite ways to eat them and makes a very special lunch dish or starter. 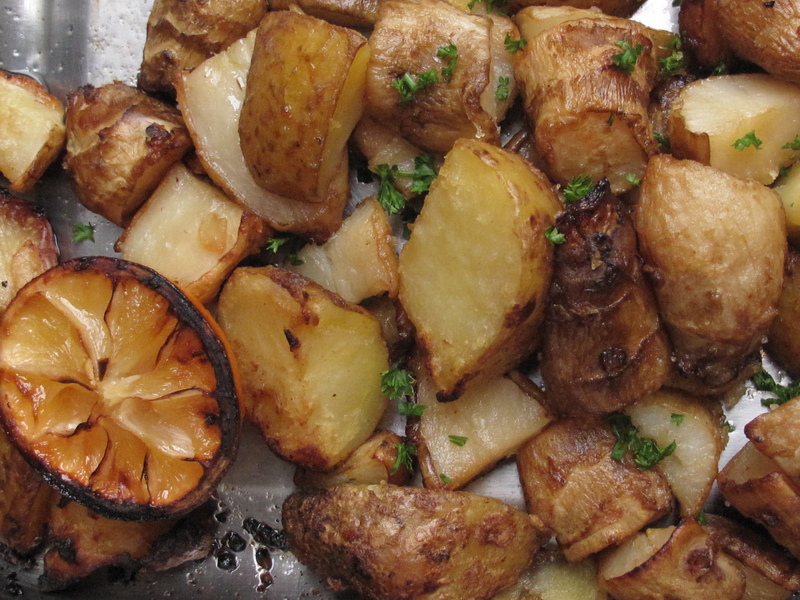 Another way to go with Jerusalem artichokes I really enjoy is roasted with spuds and lemon. It’s very simple and comes courtesy of Mr. Slater though I have adapted it slightly. It goes really well with any roast and, I suspect, would work well with fish too. Spring has sprung! ……. or at least it’s trying, last night’s freezing temperatures did make me wonder. I made soup with this week’s Cabbage and it was perfect. This recipe has beans which makes it almost like a stew so it’s almost a meal in itself…..
Start by chopping the Onions and begin sautéing over a low-medium heat with a generous glug of Olive Oil until they start to change colour stirring occasionally to stop things burning. This should take about 15 minutes enough time for you to prepare the other veg. Wash and roughly shred the Cabbage. Scrub the carrots and cut into 1 cm half rounds. Peel the spuds and chop into bitesize pieces. Finally, chop the garlic and chilli and if the onions are done add to the pot, stir for a minute before adding the rest of the veg including the tomatoes (but not the Beans) along with a teaspoon of Maldon Salt. Stir well then cover the pot and leave for about 15 minutes over a lowish heat then add 2 litres of weak vegetable stock (as usual I’d use Marigold and halve the quantity indicated on the packet so it’s not too strong). Bring to the boil then lower the heat, cover and cook for another hour. After an hour add the beans, stir well and continue to cook uncovered for a further 10-15 minutes. To serve (and this is what really makes it) take a piece of stale Bread (ideally Ciabatta or sourdough), toast it then rub the toast with a halved clove of garlic. Place the garlic toast at the bottom of your serving bowl and add the soup. Top with a drizzle of your finest Olive Oil and some freshly grated Parmesan (if you like – this is optional and some would say not necessary). Keep the faith that summer really will come this year by having a Blood Orange salad for pud. Peel a couple of oranges removing the pith as you go then finely slice them and scatter with some mint leaves. Do this ahead of time and all the flavours will mingle. A serving of vanilla or chocolate (Butlers do the best I’ve had) ice-cream would be lovely too….. This week all our selections have Chillies which can be used to add interest to almost any dish. They’ll keep in your fridge for at least a week or you can hang them up and let them dry out then keep them in a jar for future use. Drop one into a bottle of Olive Oil and you have (after a few weeks that is) a Chilli Oil that can be used to spice up anything and even makes the simplest of Pasta meals (Sauté a couple of cloves of Garlic and toss with Pasta, Chilli Oil, a little chopped Parsley if you have it and freshly grated Parmesan and voila – dinner in under ten minutes). When preparing Chillies be very careful never to touch your face (especially your eyes) or any sensitive areas as they really do burn. Either wash your hands carefully afterwards or wear rubber gloves when preparing. 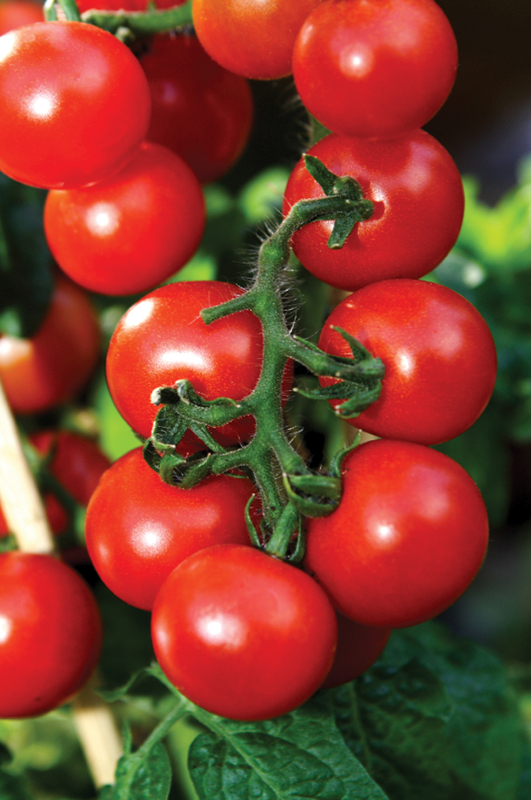 In terms of heat, it’s the seeds you have to watch as they have up to 80% of the heat so if you can’t stand it simply cut them out and use the less fiery red flesh. If you really aren’t sure, try a tiny bit on your tongue to get an idea and if adding them to a sauce or stew throw in a little, leave to infuse for a few minutes then add more if you want – it’s like Salt you can always add more but it’s very hard to counteract too much. Chillies usually get hotter as time goes by so you’ll probably want to use less if you still have some left in a week or so or are using dried ones. If you’re worried about Chillies causing indigestion, don’t be because it’s a myth and the opposite, is in fact, true. Chillies are beneficial to digestion and soothing for the stomach. Furthermore, since ancient times they have been used to treat all kinds of ailments from arthritis to the common cold and can even bring pain relief due to the release of endorphins in the brain they produce. Another thing to note is that just one contains a full day’s supply of beta carotene and nearly twice the recommended daily allowance of Vitamin C and that because they produce heat they speed up the metabolism meaning that you digest food better and (possibly!) burn calories faster. As those of you who read my recipes regularly have probably noticed, I use Chillies a lot, adding them to nearly all pasta dishes (except maybe the creamy ones). stirfries, roast vegetables, salsas and even deserts sometimes -they have a natural affinity with Chocolate and since discovering this I always add a square or two of the dark stuff to my Black Bean Chilli. The recipes this week are easy to prepare and are great served as part of a selection of stuff like Olives, Hummous, Spanish Potato Omelette, Salad and Cheeses if you’re having people over for an relaxed sitting-around kind of evening over the next few weeks………. Peel and chop the Potatoes into large bit-size pieces 1 Potatoes. Bring to the boil in a pot of salted water and cook until just underdone (i.e. with a bit of bite left). Drain and set aside. Finely slice the Chilli. Heat about 4 to 5 tablespoons of Olive Oil in a pan, add the Chilli then the Potatoes and toss over a medium heat until the Potatoes are a lovely golden brown. Season with Salt and Pepper and serve immediately on a warm dish with a dollop of sour cream on top. Drizzle the Feta with Olive Oil and sprinkle with a generous pinch of Oregano. Deseed and finely slice the Chilli and place in a line along the centre of the cheese. Wrap in tinfoil leaving the overlapping parts on the top so you can unwrap it later on and leave the cheese sitting on the foil when serving. Bake in a medium oven for about 8 to 10 minutes then serve immediately with crusty bread and some roasted tomatoes or salsa. In case you were wondering……….. The salad leaves in your bag this week are Lambs Lettuce which are gorgeous with this week’s Avocado. If you’ve started a detox look away now. This week’s recipe is a gratin with the Mushrooms and Potatoes in your bag cooked with Gruyere cheese and Cream (just in case you didn’t do quite enough damage over the Christmas).To add extra depth to the Mushrooms I add some Porcini (dried Cepes) then use the liquid I hydrate them with in the gratin. If you can’t get your hands on Porcini (they’re generally to be found in good delis) don’t worry the dish works fine without them. To begin with take the Porcini Mushrooms and leave them soaking in 120ml hot water then get on with preparing the rest of the ingredients. Wipe and slice the Mushrooms. Heat a dash of Olive Oil in a pan and thrown on the Mushrooms and sauté until golden brown then set aside. While the Mushrooms are cooking, peel and slice (about the thickness of a Euro coin or slightly less if possible) the Potatoes. Grate the Cheese and set aside. Strain and finely chop the Porcini then mix the soaking liquid with the Cream. Season this liquid with Salt and Pepper (you can add a little more Salt than normal as cream tends to sweeten things a lot especially when cooked down). To put the dish together, in a square ovenproof dish about 24 cm x 24 cm place a layer of Potatoes. Scatter about a third of your mushrooms and cheese on top and continue layering like this finishing with a layer of Potatoes. Pour the liquid over the Potatoes and Mushrooms and finally grate a little more cheese on top of everything. Cover with tin foil and bake for about 45 minutes at 180 degrees then uncover and bake for a further 15 or until golden brown. Try this with a simple Lamb’s Lettuce and Walnut salad for the perfect lunch or add a dish of roasted root veg (the Carrots in this week’s bag would be perfect)to make a more substantial meal. Our Mediteranean selections all have Artichokes this week and if you haven’t had them before you’re in for a treat. I tend to serve them as simply as possible to show off their great flavour. Last night I made Carciofi Fritti (Fried Artichokes) to pick on while we waited for dinner to cook and they went down a storm especially with 4 year old Dan who was appalled we were going to eat such a strange looking variety………. First of all prepare the Artichokes by peeling off the tough outer leaves then cutting off the top half of each Artichoke (ie the tougher/pointy part). Finally, pare back the any more tough bits until you reach the heart. It’s a lot of cutting back I know and what you’re left with seems so paltry but it is worth it I promise! Discard the fluffy stuff you find there then slice the Artichoke heart into pieces about 1/2 cm thick. Place the slices in a bowl of water then add the juice of half a Lemon and a generous pinch of Salt. Leave the Artichokes to sit for about 15 minutes then drain and pat dry. Heat about an inch of Oil in a pan and prepare the Artichoke slices for frying by dipping them in Flour then beaten Egg (you’ll need 1 large Egg) then breadcrumbs. Add the Artichokes to the oil when it’s hot but not smoking otherwise the Artichokes will burn on the outside before they’re done inside. When golden brown, remove from the pan to some Kitchen Paper then sprinkle with Salt, Black Pepper and a squeeze of Lemon Juice. Serve immediately!!! !